Western Ghat is biologically richest regions of the world. Out of 13,000 flowering species found in India, 4500 are found in the Western Ghats. Of these, some 1,500 are unique to the region. The Western Ghats are the 'hotspot' of natural evolution. Forests of Karnataka support 25% of the elephant population and 10% of the tiger population of India. 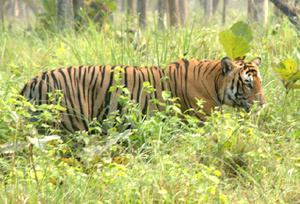 Anshi National Park in Karnataka is granted with the prestigious status of 'Project Tiger Sanctuary' in January 2007. Gyps indicus (the Indian vulture) and two species of frogs, Indirana gundia (found only in Gundia range, Sakleshpur) and Micrixalus Kottigeharensis (found only near Kottigehara, Chikkamagaluru district), tiger, Indian Elephant, Lion‐tailed macaque, turtle and dhole, the Indian wild dog. Blessed with some of the rarest species on thearth, Karnataka is one of the great wildlife destinations in India. There are more Asiatic elephants, tigers in Karnataka than any other state in India. From endangered Lion‐tailed macaque to Indian bison, Karnataka may be ranked as the India's most elusive destination. Other then the mammals, one can spot a tremendous variety of underwater species as well. Perhaps, Karnataka is one of those places in India where one can visit fish sanctuaries as well. There are six fish sanctuaries in Karnataka, which are home to 289 types of fish. More than 35 fish sanctuaries have been reported, and new are being set up by local communities. See below for in-depth information about flora and fauna of Karnataka. National Parks of Karnataka are amongst the best national parks in India. All these parks are blessed with varied landscapes and diverse species, which make it one of the best places for the photographers, conservationists, and explorers. No other places in India have an organized flora and fauna like Karnataka. The Anshi National Park is one of the least explored national parks and to one's astonishment the place is home to around 200 bird species. 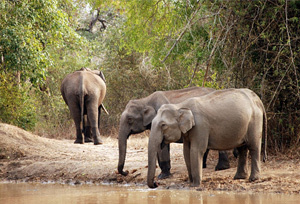 Bandipur National Park and Nagarhole National Park are the important parts of Reserve. With eighteen wildlife and three bird sanctuaries, Karnataka is deemed as the ultimate wildlife destination of India. In these sanctuaries, some of the threatened species are sheltered. What catches the eyes of visitors the most are the number of adventure activities, offered here includingwildlife safaris in jeeps, nature walks, bird watching, crocodile sighting trips, and trekking. Karnataka is adored by the bird lovers as well. There are three bird sanctuaries in Karnataka-Attiveri Bird Sanctuary, Gudavi Bird Sanctuary, and Ranganathittu Bird Sanctuary that attracts migratory birds from Australia, Siberia, and even North America. Painted Stork, Asian Openbill Stork, Common Spoonbill, Woolly-necked Stork, Black-headed Ibis, Lesser Whistling Duck, Indian Shag, and Stork-billed Kingfisher are the famous species of birds, seen in the bird sanctuaries of Karnataka. Tiger reserves of Karnataka are popular tourist destinations as it takes pride in housing the highest tiger population in India. According to a census in 2014, there are about 406 tigers living in unperturbed in Karnataka. 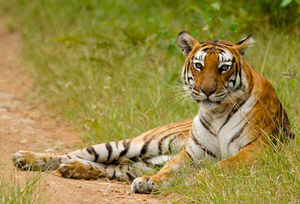 There are six tiger reserves in Karnataka and these reserves portray nature at its ultimate best. All these National Parks have captured the interest of many environmentalist and wildlife enthusiasts. What if one is not able to spot tigers one can spot many species -jackals, deer, monkey, elephants to name a few. Bandipur, a prime tiger destination is prone to poaching. To restrict such activities and for proper forest management, an android application Hejje is launched. Karnataka was the first to harness this technology. Multi-hued fish, sea turtles and dolphins- welcome to the underwater world of Karnataka. The tropical waters are teeming with marine life and are, at times, so clear that you can see fish hiding in the corals and swim across in plain sight. There are 289 types of fish, which are spotted in the fishing sanctuaries of Karnataka, out of which 41% are extinct. Mahseer, Puntius pulchellus, Long Finned Albino, Tiger­barbes, Labeo Fimbriatus, Bagarius Yarrelli are some of those species. Like the world over, native freshwater fish in India are declining rapidly. Efforts are also underway to set up a dedicated institute and society on fish conservation. Nilgiri Biosphere Reserve, established in 1986, was the first biosphere reserve in India. Sprawling over the three major states of India-Karnataka, Tamil Nadu, there are seven major wildlife reserves within its vicinity-Bandipur National Park, Mudumalai Wildlife Sanctuary, Mukurthi National Park, Sathyamangalam Wildlife Sanctuary, Nagarhole National Park, Silent Valley National Park and Wayanad Wildlife Sanctuary. The stunning mountains of Western Ghats are not only famous amongst wildlife lovers but are adored by hikers, trekkers and nature lovers. Other then the jungles, here one can see trekking trails, waterfalls, lakes and historic forts. 100 species of mammals, 350 species of birds, 80 species of reptiles, about 39 species of fish, 31 amphibians and 316 species of butterflies are the total number of species that can be found in Nilgiri Biosphere Reserve. The area has the largest population of the two most endangered species- Lion-tailed macaque and Nilgiri tahr. The region has been honoured as a UNESCO World Heritage Site in the year 2012. Its unspoilt environs and tranquil surroundings bring travellers back to this place again and again. Forests of Karnataka are home to 1493 medicinal plants belonging to 808 genres and 108 families. Most of these medicinal plants are found in the Western Ghats of Karnataka and used to cure people through traditional treatments. All thanks to Foundation for Revitalization of Local Health Traditions (FRLHT), there are 13 Medicinal Plant Conservation Areas (MPCA) and Medicinal Plant Development Areas (MPDA) established in Karnataka. All the gardens include hundreds of species and cultivars of herbs used for everything from perfume to cooking to medicine. A large chunk of Karnataka's vegetation is embellished in the Western Ghats. Indeed, a majority of plant species of the Indian subcontinent are represented in the forests of the Western Ghats and account for probably 75% of the state's plant wealth. Karnataka has many orchid plantations in its vicinity as well. The state has more than 176 species of orchids; most of them are endangered and comes under protection act. Sapota, Papaya, blue grape, jack fruit, rose onion, mattu gulla brinjal and Coorg Orange are some specific and special variety of fruit crops that can be spotted in Karnataka.